Amizade Outreach Director, Sara Noel and Amizade alum, Anthony Scaletta, are in Kyrgyzstan and Tajikistan as part of an American delegation to Central Asia promoting community based volunteerism in the Central Asian region. The trip is the second part of an exchange program sponsored by the US State Department Bureau of Cultural and Educational Affairs that brought twenty-two non-profit professionals who work with volunteers in their home communities to Pittsburgh in June for a series of workshops, presentations and organizational visits focused on recruitment, training, management and retention of volunteers. The Central Asian delegates each returned home with a Community Action Plan and a small grant to implement volunteer projects in their home communities. These projects ranged from youth health advocacy and environmental initiatives to reconstruction and renovation projects. Sara Noel and Anthony Scaletta presenting Amizade's Service-Learning Model in Dushanbe, Tajikistan. The second half of the program involved ten non-profit professionals from Pittsburgh organizations traveling to Kyrgysztan and Tajikistan. The American delegates include representatives from Magee Womencare International, the Pittsburgh Project, the Greater Pittsburgh Community Food Bank, AmeriCorps and the Greater Pittsburgh Literacy Council in addition to Noel and Scaletta. The delegates spent ten days in each country leading follow-up workshops on various topics of volunteerism as well as visiting the project sites of each of the Central Asian delegates to see the progress of their Community Action Plans. Members of the American delegation working on a volunteer project in Dushanbe, Tajikistan. 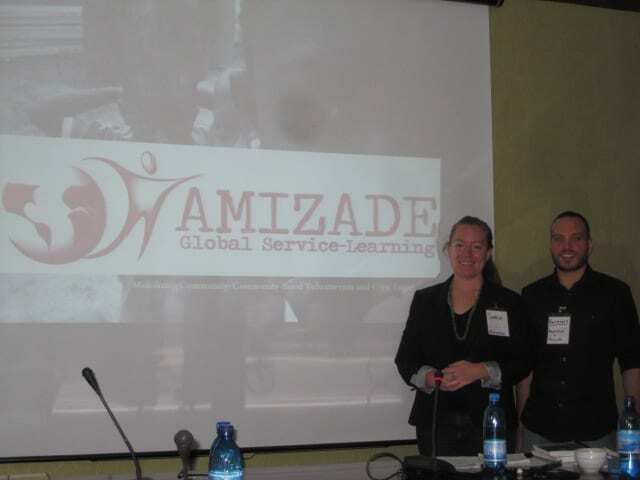 Sara Noel and Anthony Scaletta presented Amizade’s Service Learning model and led a discussion on the use of reflection as an integral part of the volunteer experience and the use of the Amizade journal as an important tool in this process. Amizade is proud to be a part of this important moment in the development of the volunteer movements in Tajikistan and Kyrgyzstan and are excited to see the projects of our new friends develop!